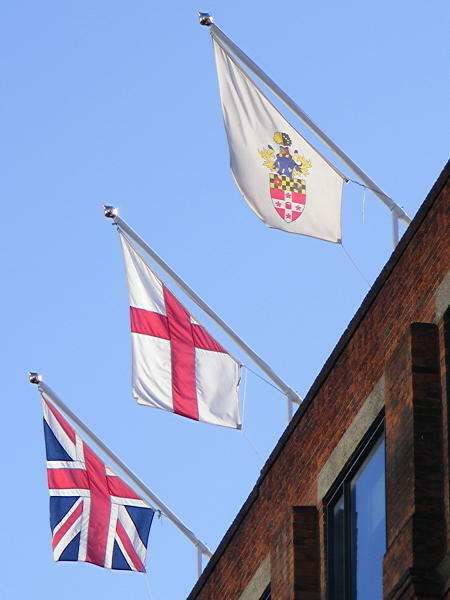 Who decided to display a cut off part of the Union Flag on the Council Offices in Tooley Street? This is a gross insult to the country, the residents of Southwark and visitors to Southwark. Whoever made the decision is ignorant and should not be employed by the council. Insulted or not I believe it is against protocol and maybe the law to deface, cut or maim the flag like this? The shape of these flags has really annoyed me and I have asked for proper shaped flags to replace them asap. Apologies to anyone affronted by them - I am working on it urgently. Surely must be a cost saving/cutting by Southwark Council! made in china no doubt! Bravo! Whose head will be on a pike at London Bridge? With all the cuts affecting people throughout the country I think the 'cut' flag is the least of our problems! Good grief. I'm still unsure why there are flags flying at all given that they cost money and do nothing. I can see why they've cut them like that (I imagine they hang badly at that angle and wrap themselves up) though I wouldn't put them up rather than cut them. However I can't get worked up about a bit of cloth that very few look at up there. And not sure if it is a gross insult to the country, the residents of Southwark and visitors to Southwark. I'd be more insulted by something far more material than a cut flag. Maybe blocking up all the roads at the same time with roadworks?